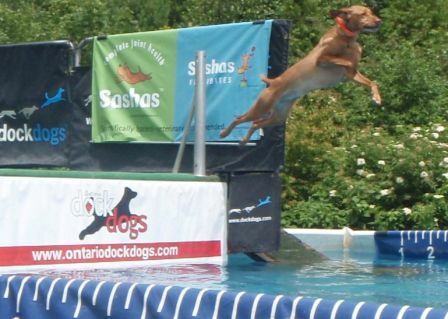 Here is Blaze qualifying for senior dock jumping champion. 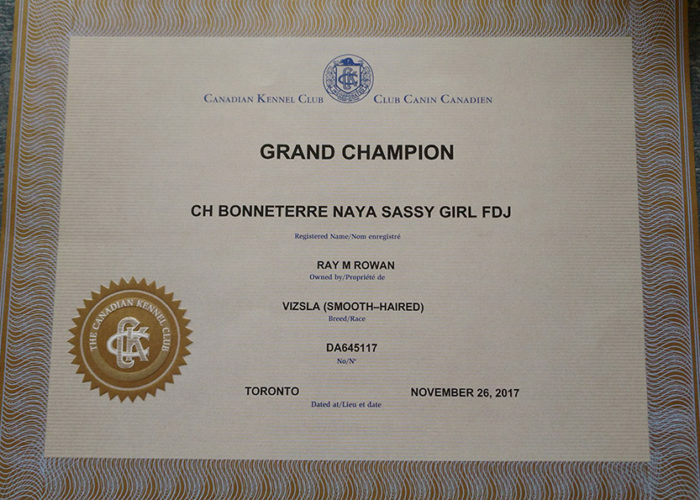 She jumped a distance of 18′ 7″. 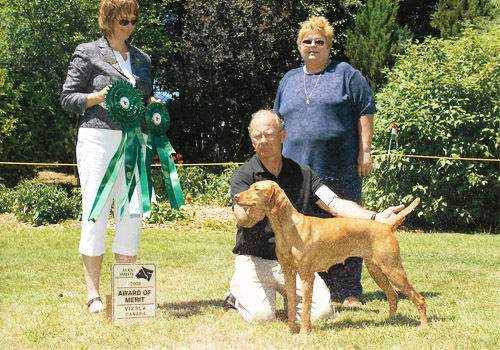 In 2008, she won the jumping title in the non-retriever breed category (and without much training)! 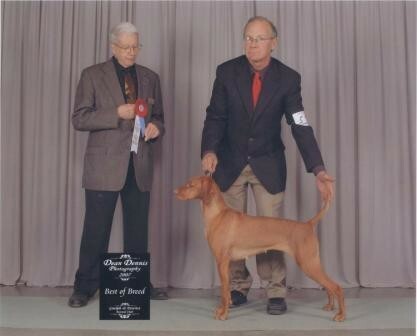 Our Blaze is a winner in the show ring, a jumper extraordinaire, a caring mother and an obedient companion. 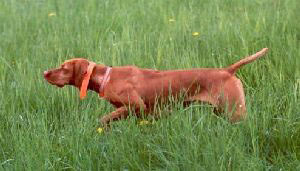 In one of the photos in the slide below, Blaze (with Ray) was showing great confirmation just a few weeks after the birth of her pups (other than a droopy tuck up). 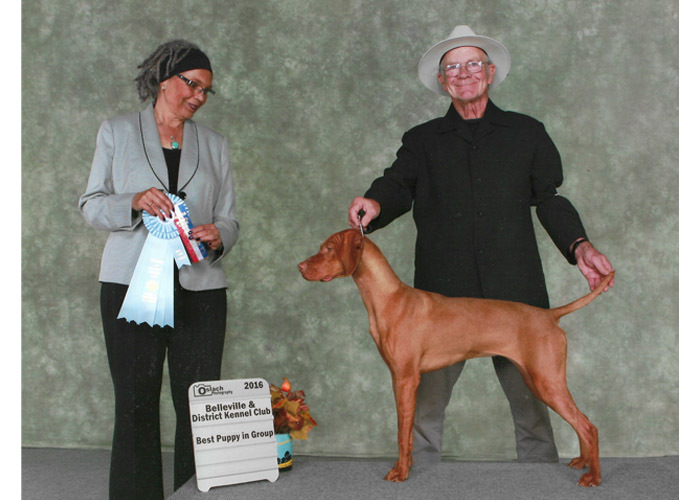 Blaze won the coveted 'Most Versatile' award beating out 157 other dogs. 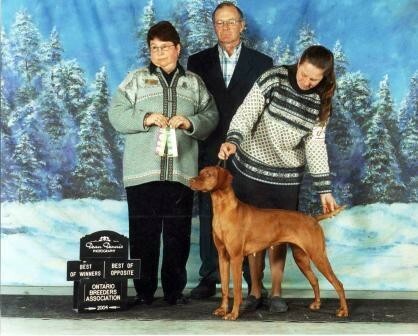 The award is given to the dog which displays excellence in both the field and the show ring. 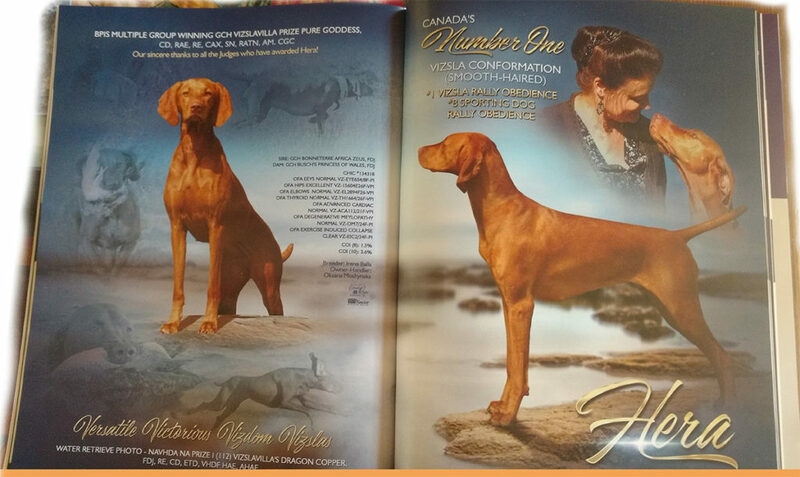 Blaze was also the #1 vizsla in Canada in 2004 FDJ at 6 months of age. 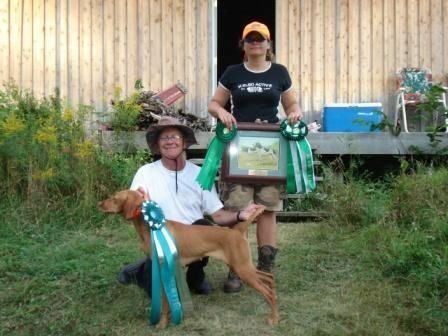 She beat out dogs who were 3 or 4 years older. 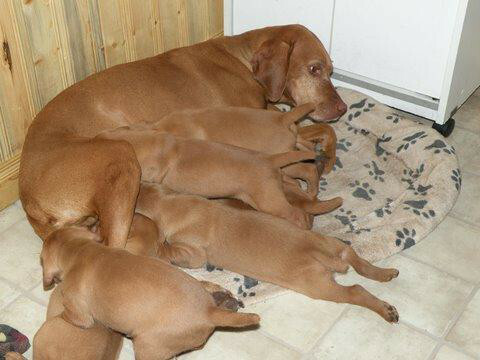 Stoney is Blaze’s mother and a grandmother to many. 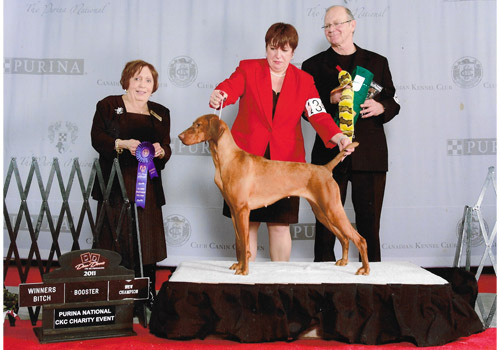 Stoney’s great temperament and motherly instincts are illustrated in the picture to the right where she is caring for newly born puppies – that are not even her own. 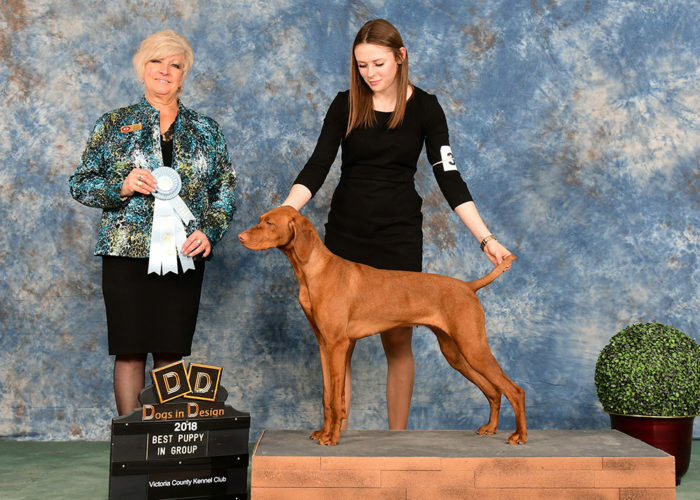 She has fantastic point in the field and has brought home a number of wins in the show ring. 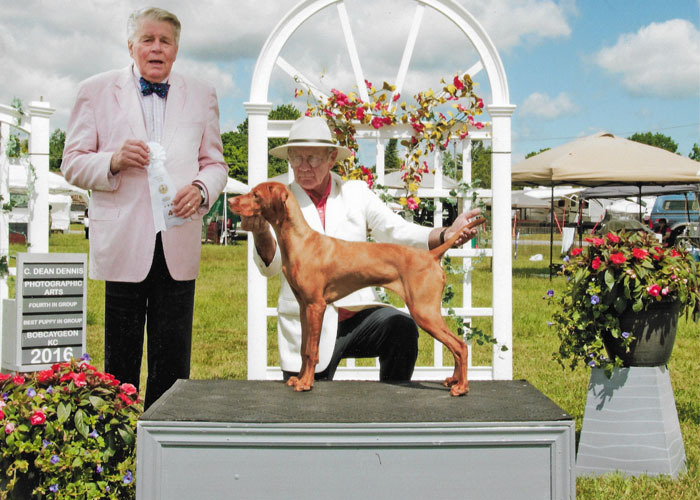 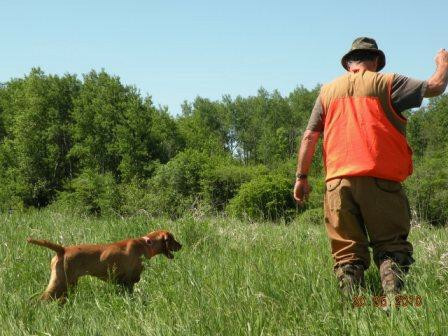 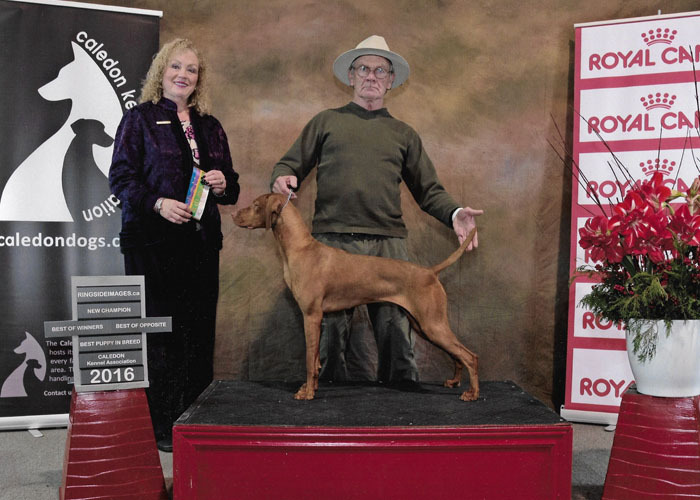 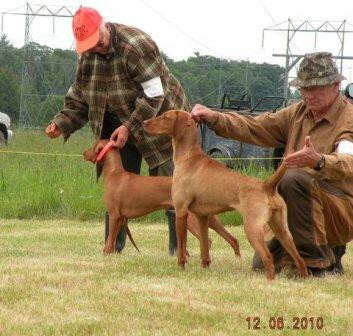 In the pictures below Cleo show her skill in the field, following in the footsteps of her Bonneterre Kennel Vizsla family. 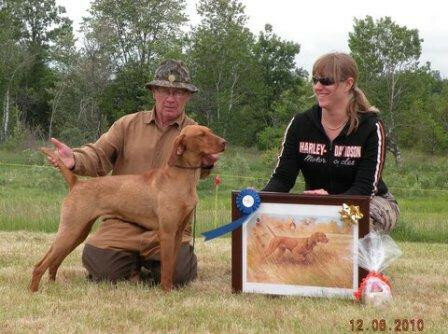 At just nine months of age she was showing great ability in the field. 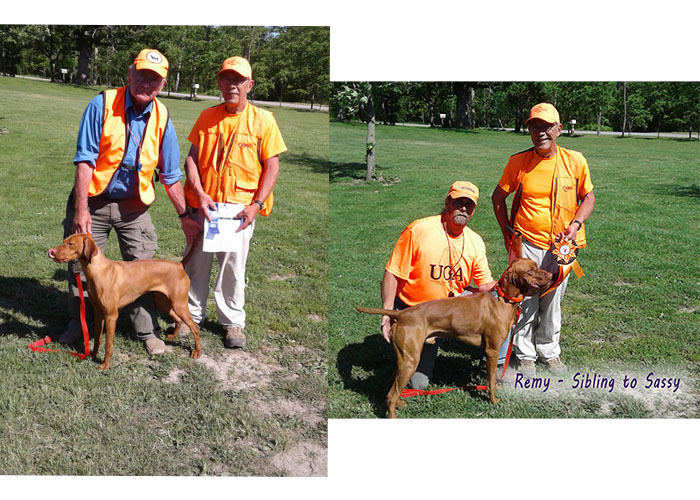 Cleo is the offspring of CH Bonneterre Blazin’ Pot Liquor FDJ, NAVHDA Prize II and CH Vizslavilla’s Rip Aszu FD, FDX, NAVHDA Prize II. 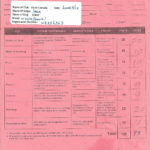 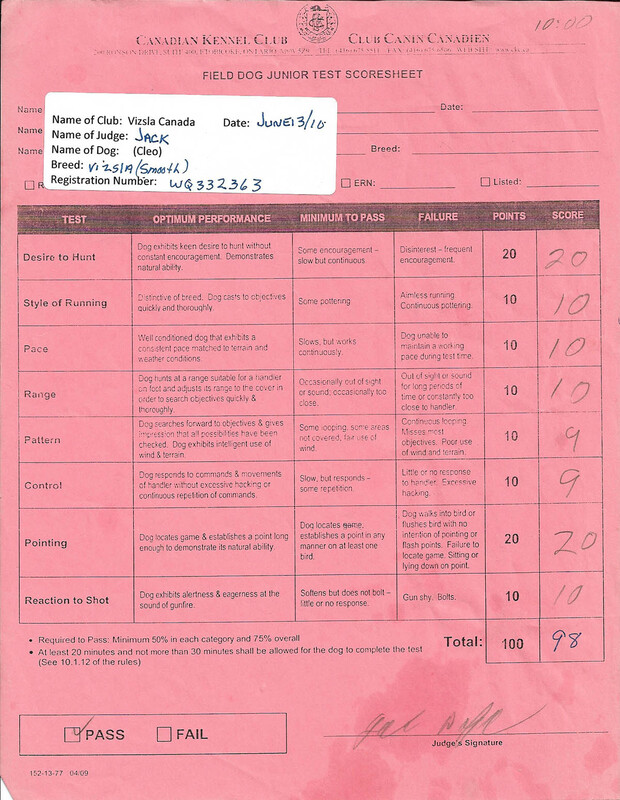 Following in her mother’s footsteps, on June 12, 2010 Cleo qualified for her FDJ designation with a fantastic score of 98. 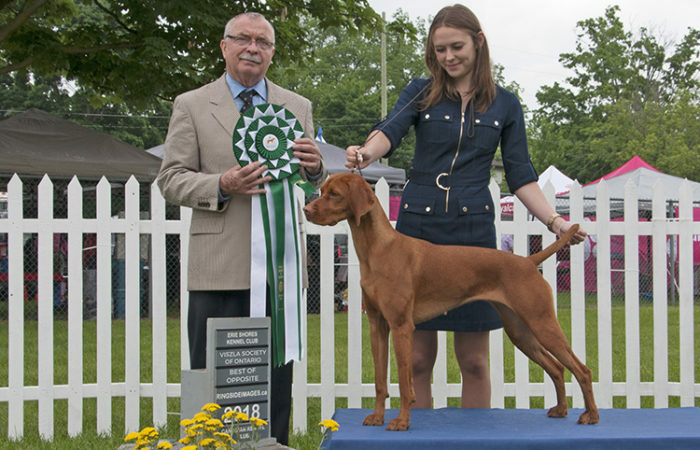 She also won the Versatility Award which is presented to the dog who performs best in the combination of the field and the show ring. 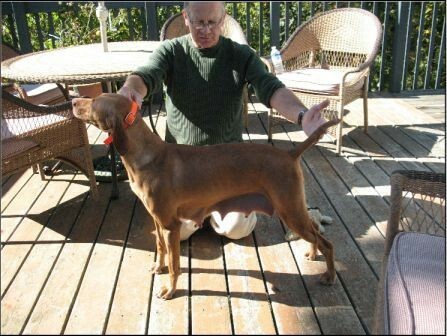 Sassy has exhibited all the fine upbringing of a Bonneterre Vizsla. 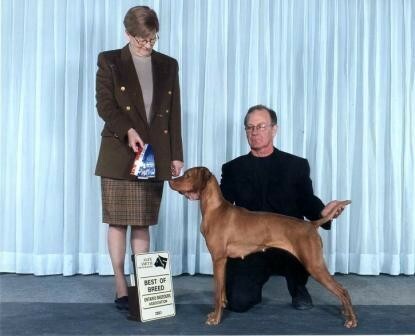 She came in first in four in her puppy show group and even beat out some elders, coming in fourth in the adult group while still a puppy. 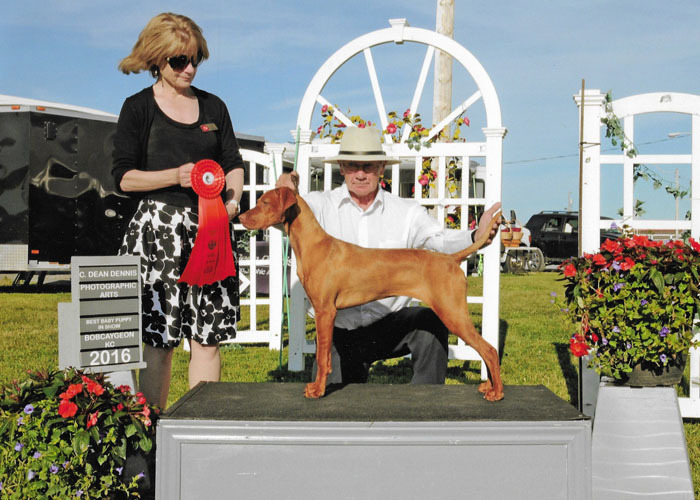 From a ‘Champion’ litter, she has been trained well, but there’s no doubt that having the genes of her parents help her excel in the ring and field. 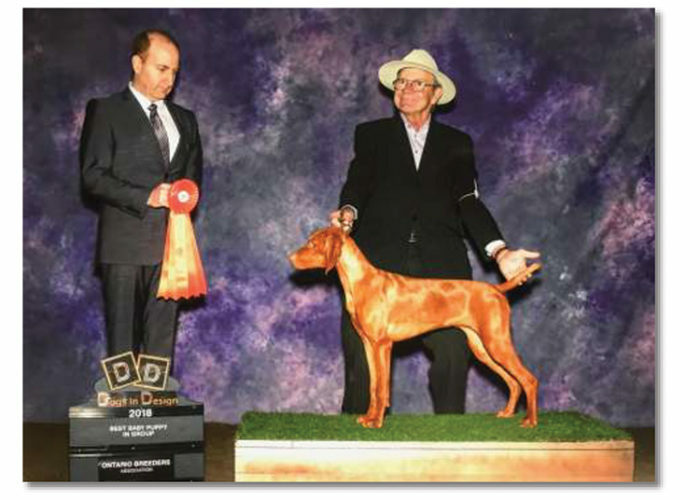 Sassy is the offspring of Sire, Champion Bonneterre Handsome Man (FDJNAV Prize 1) and Dame, Champion Vizslavilla Memphis (Two legs FDJ). 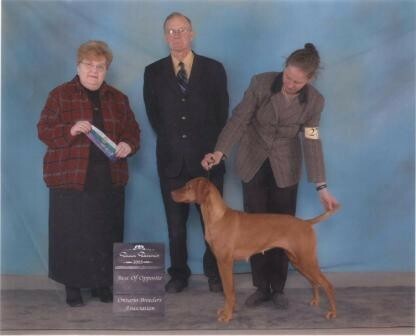 Bianka is the from the excellent lineage of Gr Ch Bonneterre Africa Zeus FDJ and ex Ch Bonneterre Just Moxie FDJ. 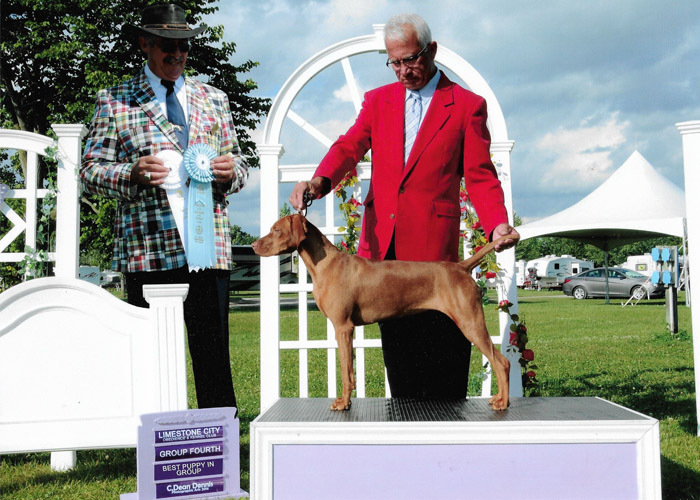 She has shown herself to be a winner at the show and will continue to follow the Bonneterre reputation for skill, obedience and companionship.